“When they arrive, give them this gift. I bought it for you to give to them. 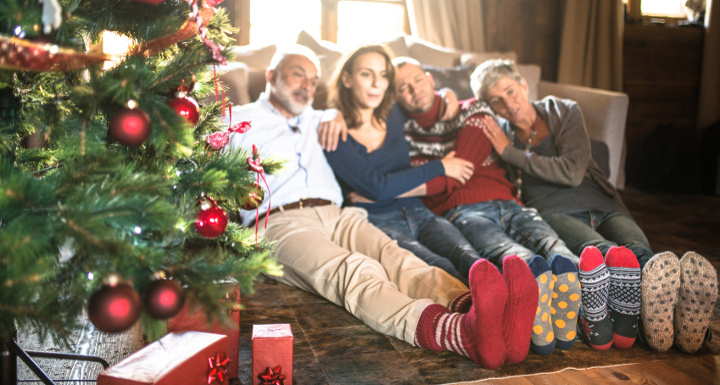 They will expect you to have a present for them because they’re bringing one for you.” With that command, my mother-in-law shoved a beautifully wrapped present into my hot hands, which were still sweaty from cradling my nursing baby. Moments later my doorbell rang, and I opened the door to greet the faces of people whom I had never before met. Because our third baby was only a few months old, and our other two littles were merely two and four-years-old, my husband and I originally planned on having a quiet, low maintenance Christmas at home. We happily invited our immediate families, and explained that we wouldn’t be cooking the typically massive feast. Instead we planned on purchasing some catered trays, and throwing together some low-frills side dishes. We wanted to keep it simple so that we could enjoy the holiday together. But that wasn’t okay with my mother-in-law. She envisioned a lavish Christmas celebration that included inviting some out-of-town guests of her own. And although we had never met these folks before, we said “of course” when she asked to add their faces to our holiday table. It was Christmas, after all, and we certainly didn’t want to be scrooges. Besides, it seemed important to her, and we were happy to host. We wanted to avoid traveling on Christmas day. And when she offered to purchase and prepare all of the food at our house, we tried to be thankful. She planned on serving a bountiful spread of delicious dishes. How could we begrudge her generosity, even if it did feel pushy and controlling? We agreed to her vision, and the guests that she invited proved to be lovely. We were thankful to have met them, and appreciated their desire to spend their Christmas with us. My mother-in-law’s cooking proved to be both over-the-top and scrumptious, and we all ended the day with happily full bellies. I wanted to be thankful. However, truth be told, that Christmas was the most stressful holiday that my husband and I have shared as a couple. Contrary to our desire for a simple gathering, most of my mother-in-law’s energy that Christmas was devoted to impressing others with food and gifts. We ended that holiday season feeling disrespected and a little, well, icky. Be honest, in a loving way. In retrospect, my husband and I could have saved ourselves mountains of stress by being honest, clear and direct with my mother-in-law. Her vision for Christmas was vastly different than our own, and we should have communicated more directly that we were going to keep it simple, with minimal pomp and no circumstance. One day you might be a mother-in-law, too. Put yourself in her shoes. This is hard. Often when there is tension or friction in a relationship, it’s nearly impossible to imagine yourself in the shoes of the other party. But one day, if your children marry, you will be a mother-in-law, too. And you will surely make mistakes. You may even offend or upset your child-in-law. So imagine yourself in 20 or 30 years, and consider how you would want to be treated. Show your mother-in-law grace, even if you don’t want to, and even if she doesn’t deserve it. Remember the golden rule, and do unto her as you would want your future child-in-law to do unto you. Understand that you can’t change her, nor should you try. Your mother-in-law is who she is. And at 50, 60 or 70-plus years old, she’s unlikely to make major changes in her personality or outlook on life. Is she stubborn? Overbearing or controlling? Does she offer unsolicited advice and critique your approach to celebrating the holidays? Does she attempt to impose her Christmas traditions on your family? Look, I get it. Those behaviors are terribly difficult to deal with. But you’re not going to change her, so stop trying. There is a measure of freedom in simply accepting that she is who she is, and she probably won’t change. Love her, even if it’s from a distance. Bitterness is an evil root, and its antidote is love. Love your mother-in-law, even if you never have a close relationship with her. Remember that she gave birth to your husband ­– the man you loved enough to marry! After all, contrary to what society tells us, true love is often a one-sided proposition. We choose to love someone, even if they don’t always love us well. And it prevents that root of bitterness from spreading inside of you, threatening to consume you. For bitterness can make us do and say some ugly things…things we later regret. So choose to love your mother-in-law, as much for yourself as for her. It will do your heart good. As much as I want all of the answers when it comes to dealing with my mother-in-law, sometimes I’m still at a loss. In-law relationships are often inherently tense, and I need God’s strength and wisdom to help me engage with them. So I offer up my relationship with her to God, and rest in the freedom of trusting him to be at work in even the tiniest details of our interaction. Leah Raup is a former lawyer turned never-bored housewife and stay-at-home mom to three tiny humans. Check her out at unboredhousewife.com where she writes about food, family, fitness and faith.